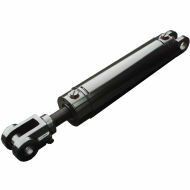 The 3000 PSI rated RAMLOK® hydraulic cylinders feature a unique construction technology that incorporates premium materials and unique production methods. The RAMLOK® steel rings securely lock the cylinder barrel to the head and base. This enables quick and easy service access for seal replacement. Standard models have a bore size of ½" increments from 2" up to 4" and stroke ranges of 4" up to 36". Port alignment can be changed according to customer requirements. Replacement parts and seal kits are readily available. 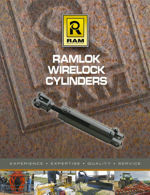 Contact RAM today to learn more about RAMLOK® Cylinders. © 2019 Ram Industries Inc. All Rights Reserved.